This small and concise booklet is a manual or a guide to health. Gandhi who wrote it in Gujarati and Sushila Nayar who translated it in English is to be commended for both, the choice of the topic and its lucid presentation. This book is welcomed by common medicine enthusiasts and students, alike. Gandhi wrote these chapters while he was confined in the Agakhan Palace at Poona during 1942-44. By writing this book Gandhi wanted to convey to his people and to the world on the vital question of Health. To him, a study of this question was part of the service of God and his creation, which was his mission. This book is translated into several Indian and European languages. Gandhi wrote a few articles under the heading "Guide to Health" in 1906 in the "Indian Opinion" a weekly started by him and later these were published in book form. He wrote this book as he had looked upon the problem of health from a novel point of view, somewhat different from the orthodox methods adopted by doctors and vaidyas. The book covers various aspects of health including the human body, air, water, food, brahmacharya, condiments, tea, coffee and cocoa, intoxicants, opium and tobacco. The articles, though brief, are rich in content and enable the reader to have a basic idea of Health. 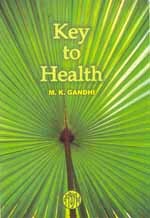 Gandhi gave it the name "Key to Health", and said anyone who observes the rules of health mentioned in this book will find that he would have the real key to unlock the gates, leading him to good health. He will not need to knock doctors or vaidyas doors from day-to-day.